Home Any Occasion Have You Used Your Paper Pumpkin Pieces? Use Every Piece of Your Paper Pumpkin! 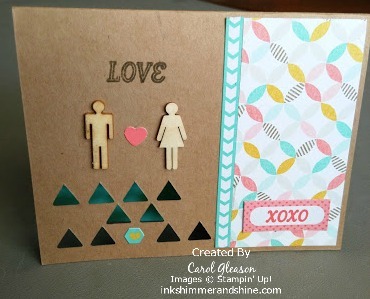 One of the kits I used is the from the Love Notes Paper Pumpkin, January 2014, including the fancy card base with the triangles cut out on the front. I added a Coastal Cabana and Summer Starfruit heart, the coordinating arrow border, and the XOXO sentiment. Then I stamped ‘Love’ in Soft Suede on the Kraft background. You may recognize the little Calypso Coral heart between the man and woman as a scrap from the April 2014, Framed Love Paper Pumpkin. The kit was originally used to create a Mother’s Day frame. Next I was searching for coordinating paper, and what did I find? The Best Year Ever paper from the Sale-a-Bration catalog, which I adore! Don’t the colors go well together with this set? They look like they were meant to be together! The man and woman wooden cutouts on this card are from the December 2013, Paper Pumpkin – Real Life journal. With the Love stamp, and the tiny little hearts, this card could be used for any sweet occasion. Maybe a non-traditional valentine, a wedding card, or just an ‘I love you’ card. Look around your craft room and see what you can combine together to come up with a new creation. With Paper Pumpkin kits, it’s especially easy, since many of the parts are cut or punched for you, and some are just ‘peel and stick’. How easy is that?? If you’re not currently subscribing to Paper Pumpkin and you’d like to try it, I’d love to show it to you! Or you can go directly to the Paper Pumpkin link to get started. See more Paper Pumpkin samples on my Pinterest Paper Pumpkin board. Best Year Ever, Love Notes, Real Life. Bookmark.